NFL: Have the Raiders Fixed Their Problems at Wide Receiver? The Oakland Raiders are one of the most storied and successful franchises in NFL history. They have won three Super Bowl titles and have seen 24 players, coaches, and executives, including longtime owner Al Davis, inducted into the Pro Football Hall of Fame. Things haven’t gone so well as of late for the silver and black, however: their last winning season came all the way back in 2002, and the team will be on their eighth full-time head coach since their blowout loss to the Tampa Bay Buccaneers in Super Bowl XXXVII. One of the biggest reasons for the lack of success in Oakland has been the franchise’s inability to find difference makers at the wide receiver position. During the teams’ most recent run of success from 2000-2002, their offense was fortunate enough to have two Hall of Fame wide receivers at their disposal in Jerry Rice and Tim Brown (pictured above). While both players were nearing the end of their careers during that stretch of time, they were both easily still among the best wide receivers in the league at that time. 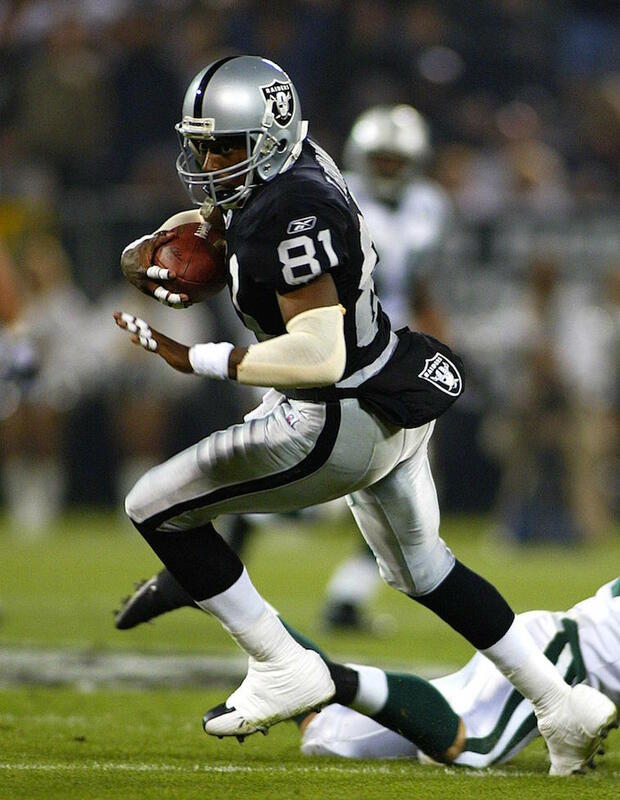 Rice and Brown both left town following the 2003 season, and the Raiders have only had one receiver who has had a 1,000-yard season – Randy Moss in 2005 – in the time since their departures. Since the days of Rice and Brown, the Raiders have searched high and low for an elite wide receiver, but have constantly come up short. First there was Jerry Porter, who was a solid player, but far from a No. 1 caliber wideout. After the Porter experiment failed, the team traded for Moss in 2005. At the time of his acquisition, Moss was still in the prime of his career, but never played up to his ability during his brief stint in Oakland. After the move to add Moss proved to be a flop for the Raiders, the team went out and spent big money on free agent wide receiver Javon Walker in 2008. Walker’s six-year, $55 million contract, that included $16 million in guaranteed money, yielded a total of 15 receptions for 196 yards and one touchdown. And then there was the selection of Darrius Heyward-Bey, an unpolished, yet freakishly athletic wide receiver, with the seventh overall pick in the 2009 NFL Draft. Heyward-Bey proved to be a bust, and is now the poster child for the moves made during the late Al Davis’ final years as the team’s owner and General Manager. Since crashing and burning with Heyward-Bey, the Raiders have played it relatively safe when it comes to addressing the wide receiver position. That was until this past offseason. After landing top-five picks in the NFL Draft for three-straight years, the Raiders finally opted to use an early first round pick to address their issues at wide receiver. 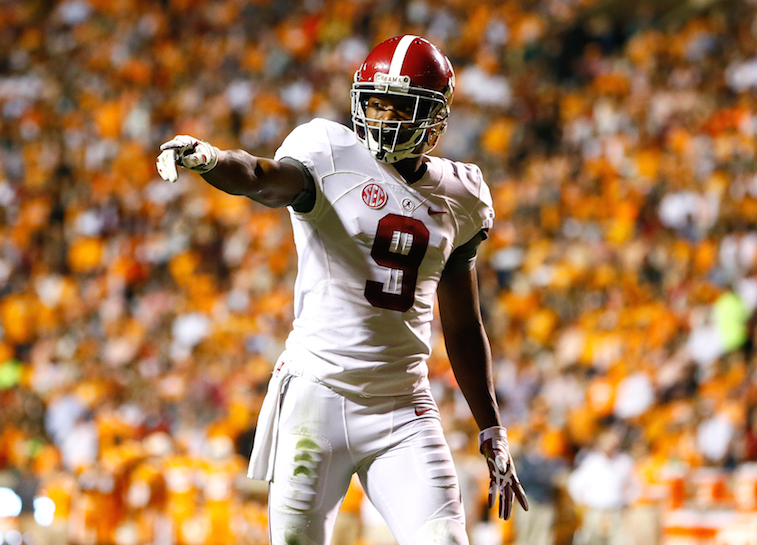 With the fourth overall pick in the 2015 NFL Draft, the Raiders selected former Alabama wide receiver Amari Cooper, who won the 2014 Fred Biletnikoff Award as the best wide receiver in college football. Prior to the draft, most scouts viewed Cooper as one of the most polished wide receivers to come out of college in several years, and by several accounts, he has been as good as advertised. The 6-foot-1, 211-pounder has constantly been turning heads throughout the team’s offseason program and training camp. The team is fully expecting him to make an immediate impact, likely as the team’s No. 1 wide receiver, during his rookie season. One of the big surprises of Raiders training camp has been Michael Crabtree. The former San Francisco 49ers wide receiver entered the league as a first round pick with incredibly high expectations, but never really emerged as a Pro Bowl-caliber player in San Francisco. That could be changing in 2015. Multiple reports out of Oakland are saying that the 27-year-old Crabtree has been nearly unstoppable in practices, and that he has an excellent rapport with second-year quarterback Derek Carr. With that being said, going against Keith McGill, T.J. Carrie, and D.J. Hayden isn’t exactly the same as going up against Chris Harris Jr., Darrelle Revis, or Richard Sherman. The first thing that anyone who has attended a Raiders training camp practice will tell you is that the team will have a different culture and attitude under new head coach Jack Del Rio. The second thing they will tell you is that the team may have finally fixed their problems at the wide receiver position.